Topsy Napaljarri Dixon paints for the Warlukurlangu Artists Aboriginal Corporation located at the Yuendumu community 300km north-west of Alice Springs in the Northern Territory of Australia. Established in 1985, Warlukurlangu Artists Aboriginal Corporation is a fully Aboriginal owned and governed art centre with over 600 members. One hundred percent of the proceeds from the sale of all art works go directly back to the artists and their community projects. The art centre is famous for its gloriously colourful acrylic paintings with many of its members work collectable having been featured in hundreds of exhibitions both in Australia and around the world .The art centre is both a stronghold of traditional Warlpiri culture and an essential part of Yuendumu's community life. 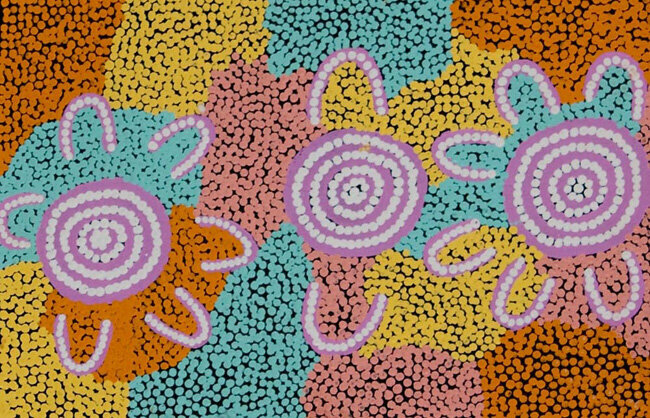 In this painting the concentric circles depict a meeting place for women to come and talk and dance together as they have been doing for thousands of years in central Australia. The U shapes represent the women.